Even at glance we know Instrument A has superior reproducibility. 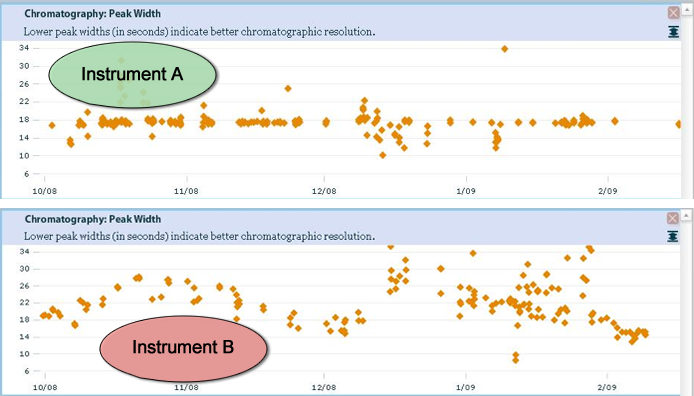 MassQC's Control Charts can show if an LC-MS instrument is performing similarly whenever it is run. The first graph shows an instrument that, except for a few outliers, has consistent, repeatable peak widths over a period of 4 months. In the same time period, the second instrument has a much more variable LC system. It's noteworthy that outliers are present in both graphs. These may indicated some short-lived problem addressed by the mass spectrometrist during normal operations. MassQC enables analysis of spray heads, LC systems, sample preparations, and instrument tuning methods. It is a comprehensive feedback tool that leads to better laboratory performance.